The kindergarten has an excellent opportunity for a sustainable health promotion, because all children of the respective age groups are reached. Kindergartens staff plays a key role in improving food quality and development of eating habits, because of the characteristic close relationship between kindergarten staff and children and because of their connecting position between carrier organization, parents and of cause the kids. They are the driving force and have the possibility to set food-standards in teaching work as well as in establishing a healthy and sustainable boarding. An action plan is a detailed plan outlining the actions that are needed to reach your goals. 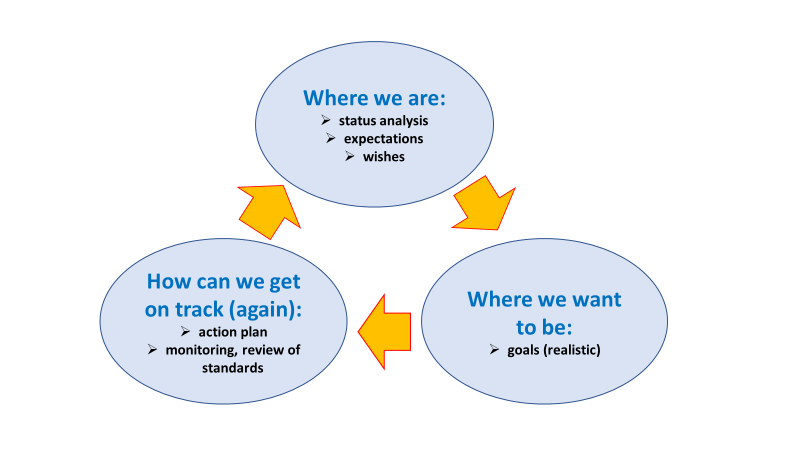 When creating action plans there are guided steps that need to be followed to ensure success. First collect all ideas, how to reach your specific objective. Than choose together the most success-promising ideas/actions. A tabular action plan facilitates planning and gives an overview of your action steps. Action steps should be clear and actionable and not vague ideas or thoughts. Each action step needs to have one/more person/s of your nutrition team responsible. 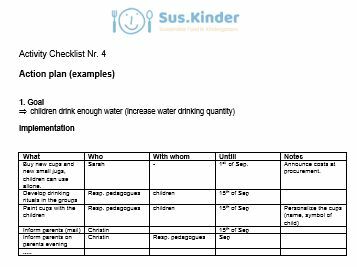 In the following checklists you´ll find an example of an action plan and a template that can be used in your kindergarten. Tipp: Structural changes which are fix integrated into the daily routine are maintained longer than a single project.